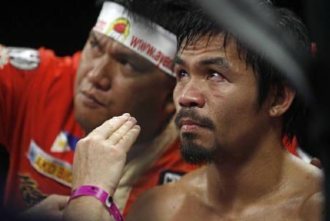 More than enough has been written about the end of the 15 year relationship between Filipino boxing idol, Manny Pacquiao and his long-time US-based trainer, Freddie Roach of the Wildcard Gym in Hollywood. Speculations galore were not lacking as to what really is or are the reason(s) for such a “break” in a relationship that saw Pacquiao win an unprecedented boxing belts in 7 divisions and brought Roach numerous “Trainer of the Year” awards. One particular possible cause that was well plastered in the internet blogs was Roach was axed because he apparently lost control of the corner. There apparently were issues during the heat of the battle, something that is tantamount to lack of control and the confusing instructions and other events involving the three main people in the corner, Roach, assistant trainer Buboy Fernandez and cut man Miguel Diaz. The issues could have been avoided if there was time taken to discuss them before the fight. In fairness, they might have been, but perhaps during the heat of the battle, with all the adrenaline pumping, they were simply ignored or perhaps forgotten. a. The Head Trainer - The head trainer must lead, oversee and manage the whole event, from the training to post fight. He is in charged with analyzing the boxer’s skills as well as his opponent’s, and creating a combination of strategies and strength to secure a win. This person is responsible for formulating the game plan plus a couple of others known as “Plan B” and “Plan C”. These plans determine what needs to be done during training and at the actual fight. The responsibilities also include all that is happening in the gym, including but not limited to the “mitt sessions” and actual sparring and taping of the boxer’s hands before sparring sessions and the actual fight. He should also be present at the “Rules Meetings” conducted by the Commission and during the selection of gloves for the fight. Further, the head trainer to set rules in the gym to allow the boxer to focus on the task without distractions from fans and celebrities that like to rub elbows with the boxer. It should be pointed out that “celebrities” and politicians should not be granted special privileges that are not afforded to the ordinary fans. The head trainer must also institute a pre fight meetings with the other corner people to set rules and how to implement their individual roles. This is a very important task that needs to be emphasized prior to the fight. b. The Assistant Trainer(s)- it is the job of the assistant trainer to see to it that the instructions formulated by the head trainer are implemented. He is also responsible for all the gears used by the boxer, the jock protector, training gloves, tapes, mouthguards, shoes and even the socks plus what ever other item the boxer wishes to have like special t-shirts and even towels. During the fight, it is of prime importance that the assistant trainer does not give his own instructions unless directed by the head trainer. He should focus on the job of “assisting” and assuring that the stool and the spittoon are placed and removed on time. c. The strength and conditioning coach: The duties of this person are all performed before the actual fight occurs. His job is done as soon as the first bell rings. This person sets the different conditioning exercises to gradually build up the strength and the stamina of the fighter during training. In many occasions he is also responsible for the dietary needs of the fighter to coincide with the gradual build up of the fighter’s physical condition and weight requirements. It is also this person’s responsibility is to assure that the boxer comes in on the correct weight during the weigh-in a day before the fight, and his gradual re-hydration after the official weigh-in. c. Cutman – As the title implies, the cutman must focus on the cuts and other injuries during the fight. It is his responsibilities to manage the cuts and injuries to give the fighter “one more round”. The responsibilities include procuring fresh, correct and legal prescription drugs allowed by the Commission to address injuries during and after the fight and assuring that there is enough ice and water during the fight. A particular issue each team member must recognize is that fact that when the fighter suffers a cut, the cutman must be the one to enter the ring between rounds to manage the cut properly. The cutman must have access to see the full face of the fighter for quick assessment and management of the injuries. During these times, the chief trainer and assistants stay on the apron and do their job from there. One interesting comment I heard indicates the importance of the corner crew working like a well-greased machine. Each crew member must know his exact job description and should never interject much less interfere with the job of the other crew members. There is a time and place for those types of discussion. During the fight each one must focus on their designated jobs. With that, there will be no chaos in the corner.